Tybee Island is one of Georgia's barrier islands and a popular coastal retreat near Savannah. 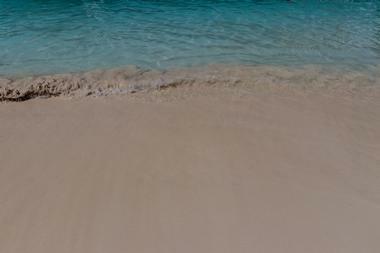 The island is famous for its wonderful, wide sandy beaches. One of the most famous is South Beach, with a lively pier that stretches far into the ocean as well as a picnic pavilion. On its northern end, the island features Fort Screven, 19th century gun batteries, as well as the Tybee Island Light Station and Museum. The lighthouse was built in the 18th century and is still functioning. The museum, located in Battery Garland, tells the story of the local history. This combination of history, magnificent natural beauty, and Southern hospitality make Tybee Island a popular family vacation destination. Cumberland Island is Georgia's largest Golden Isle, and most of this barrier island is protected within the Cumberland Island National Seashore. It has wonderful sandy beaches, ancient dunes, large marshes, dense maritime forests, and clear freshwater lakes. 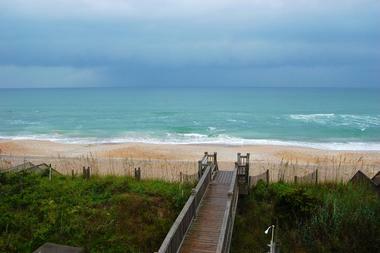 Within the national seashore there are also many historic structures and sites. The island's largest town is St. Mary, where the ferry stops. The town has a nice little history museum that tells the story of missionaries, natives, African slaves, and rich industrialists, all of whom walked the island's shores. Part of the national seashore is the 9,886-acre Cumberland Island Wilderness. Located on Georgia's Sapelo Island, Cabretta Beach sprawls along the island's eastern shore, ending at the Blackbeard Creek outflow. It is remote and favored by those looking for solitude and peace. The sand is hard packed, making it great for walking and running. Most visitors are fishermen and kayakers stopping by on their way to Blackbeard Island. There is a small wilderness campsite with showers and toilets. Sapelo Island is one of Georgia's largest barrier islands and can only be accessed by ferry. It is great for hiking through beautiful maritime forests or kayaking through vast salt marshes. Very popular with photographers and wedding parties, Driftwood Beach is located on the north side of Georgia's Jekyll Island. Its landscape is incredibly photogenic and almost otherworldly, with a huge number of dead oak and pine trees and bleached driftwood, a veritable tree graveyard. The trees are victims of the slow yet inevitable erosion of the island's northern end. Driftwood Beach stretches from the Villas by the Sea Resort and Conference Center and the Clam Creek Picnic Area and is not far from the Jekyll Island Campground. Not so long ago this beach used to be a popular picnic area. It is now closed for swimming and other activities as it is unsafe due to the constant erosion, but it is great for long walks. East Beach is the popular name of the St. Simons Island public beach, a stretch of fine white sand a few miles long on the island's ocean side. The dog-friendly beach is popular for swimming, sunbathing, hunting for shells, kite boarding, and all sorts of other watersports. The sand is hard packed and is great for hiking, running, and biking. Massengale Park on the beachfront has picnic tables and bathrooms. On the northern end of East Beach is Gould's Inlet and to the south of it is the US Coast Guard Station and the island's most popular beach. Located on the south side of Georgia's Jekyll Island, south of the South Dunes Picnic Area, Glory Beach is a huge, wide sandy beach lined with massive sand dunes covered with verdant sea oats. This beach is known as a sanctuary for nesting and resting migratory birds, and to protect the birds, no dogs are allowed on the beach. Glory Beach is a part of Jekyll Island's beach and can be accessed only from the Jekyll Island Soccer Complex through a long boardwalk that was built by the producers of the movie Glory, which was filmed on the beach. On a clear, sunny day you can see Little Cumberland Island from the boardwalk. Located at one end of Bruce Drive near the Coast Guard Station on St. Simons Island, Gould's Inlet is one of the most beautiful beaches on the island. It is located at the opening of Postell Creek, which separates Sea Island from St. Simons Island. Because of the strong currents and a dangerous undertow, the beach is unsuitable for swimming, but it is great for fishing, birdwatching, and just relaxing by the ocean. From the beach you can see Sea Island across the creek as well as many species of coastal birds. You can also see fishermen throwing their lines off the pier as well as paddleboarders trying to catch waves. Great Dunes Park is located on Jekyll Island's North Beachview Drive, across the road from a mini-golf course, a playground, and bike and Segway rentals and it is a great launching spot for a day trip to Jekyll Island. Leave the car at Great Dunes Park and rent bikes for the whole family; there are more than 20 miles of wonderful bike trails on the island to explore. The park is used regularly by the Georgia Sea Turtle Center, which is located across the island, as a release site for rehabilitated sea turtles. Many local annual festivals and events are also held at Great Dunes Park. You can spend the whole day here - the park has grills, picnic pavilions, a covered deck, restrooms, a spacious grassy area, and bike racks. The park has easy access to Jekyll Island's beach. Georgia's John Tanner State Park is a 138-acre park located between Mount Zion and Carrollton. The park, a Carroll County landmark, has two lakes and one of the lakes has the biggest sand beach of all of Georgia's state parks. There is also a pleasant nature and walking trail that goes around one of the lakes as well as a camping area, a spacious picnic area, and mini-golf. Fishing and paddleboarding are also popular. For those who wish to stay longer, there is a 40-person group lodge with bunk beds in addition to a campground and a motel. This wonderful beach is very popular with kids, but it does get crowded on holidays and weekends. Lake Lanier is a large basin in northern Georgia that was created in 1956 as the result of the construction of the Buford Dam on the Chattanooga River. The lake covers about 40,000 acres and has 700 miles of coastline. The lake's public beach is popular with Atlanta folks as a weekend escape, offering diverse outdoor recreation and excellent facilities. There are almost 100 parks around the lake, and 24 of them have beaches. Lake Lanier Public Beach is among the largest and most popular. It has volleyball nets, a kids' lagoon, and boat docks. There are many hiking and biking trails around the lake and through the surrounding forests. One of the smallest but also the most beautiful barrier islands among Georgia's gorgeous Golden Isles, Little St. Simons Island attracts visitors with its magnificent natural unspoiled beauty and especially its 7-mile-long sandy beach. The 11,000-acre island is privately owned and can be accessed only by boat. Accommodation is available in the charming Old World Lodge, surrounded by marshes and moss-draped oaks. To ensure the island's long-term protection, the owners donated to the Nature Conservancy a conservation easement on the whole island. The island is a heaven for those seeking solitude and an unspoiled natural landscape, and it offers a range of activities such as canoeing, birdwatching, hiking, biking, fishing, and swimming. 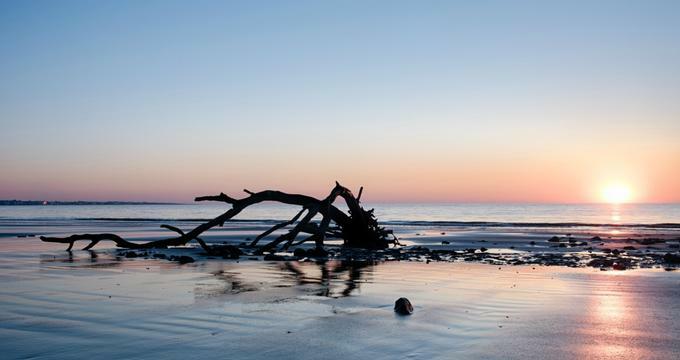 Located on the southeastern end of Sapelo Island, Nanny Goat Beach is an important part of the island's rich and unique ecological zone. The beach is used as an outdoor classroom by the Sapelo Island National Estuarine Research Reserve, and its scientists sometimes also bring groups of visitors to enjoy beach walks. The beach is 2 miles long and is covered with fine white sand, where kids love to hunt for whelk shells or sand dollars. There are many birds that make the beach their home, such as blue herons, ospreys, egrets, bald eagles, and sometimes even plain chachalaca. A paved 1-mile-long trail links the beach with the R.J. Reynolds House, passing through five ecological zones. Located on the ocean side of Jekyll Island, South Dunes Beach is separated from the nearby South Dunes Picnic Area by massive 20-foot-high ancient dunes. The beach can be reached by an elevated boardwalk, which also offers wonderful views of the island. The huge dunes protect the beach from the strong winds, making it a favorite for families with small kids. The beach provides a home and nesting ground for resting migratory birds, so pets are not allowed. The nearby South Dunes Picnic Area provides grills, picnic tables, and open and screened picnic pavilions. It also offers restrooms, showers, and a freshwater pond. Located on the southernmost end of Jekyll Island between the Glory Boardwalk and the St. Andrews Picnic Area, St. Andrew's Beach is not far from Jekyll Point. It is a popular place for watching dolphins and migratory birds, and the best spot for it is a two-story wildlife observation platform in the picnic area. The platform also offers a view of the Jekyll Creek outflow. The historical marker for the Wanderer, the last American ship transporting slaves, is also located within the picnic area on the beach. Pets are allowed but must be on a leash. The beach is fairly narrow and at its back is a lush maritime forest, creating an air of seclusion and peace. One of Georgia's famous Golden Isles, 14,640-acre St. Catherines Island is located about 20 miles from Savannah, between St. Catherine's and Sapelo Sounds. It is about 10 miles long and up to 3 miles wide, with most of it covered in wetlands and tidal marsh. The island is also known for a wonderful sandy beach, which is not open to the public as it is owned by the Saint Catherines Island Foundation, except from below the high tide line. During the day, visitors can use the beach for searching for shells, hiking, or picnicking, but they are not allowed to enter the island's interior. 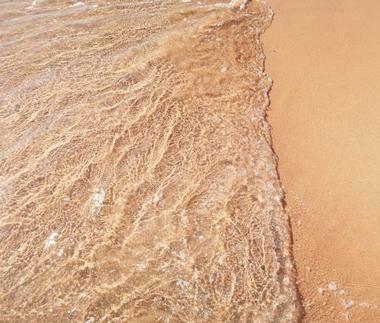 The lovely sandy beach is over 11 miles long and wraps around the island's eastern side. The beach and its surrounding areas are a nesting ground for endangered marine turtles.